The expense of traveling can be quite daunting unless you’ve saved enough money in advance to carry you through. 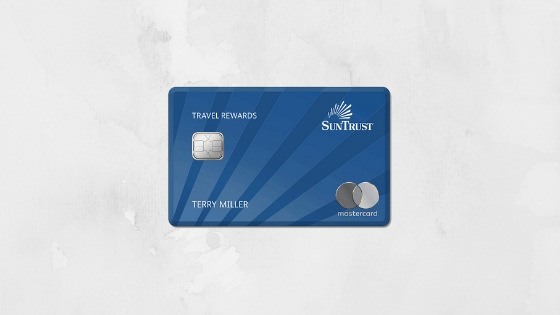 This is where the SunTrust Travel Rewards Credit Card comes in, to offer overseas financial back-up when you need it and reward you with exclusive travel perks. This credit card comes with amazing advantages which every traveler should have the chance to to enjoy. In this article, I will discuss more of its unique features and benefits and how you can apply today. First of all, if you spend $3,000 on qualifying purchases in the first 3 months after opening your account, you’ll get a nice little $250 Statement Credit in the mail. If you spend a lot of time in airports, great news! You can enjoy exclusive access to select offers in more than 400 airports worldwide. As a SunTrust World Elite Mastercard cardholder, you’ll also get access to 850+ airport lounges around the world. However, fees may apply. What’s more, the flexible rewards options are second to none with the opportunity to enjoy hundreds of redemption options, including: hotel stays, cash back, cruises and so much more. If you’re on the road, no worries! You can simply access and redeem your rewards online. Finally, you can appreciate zero foreign transaction fees. 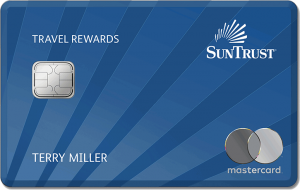 Interested in applying for the Sun Trust Travel Rewards Credit Card? If you are eligible, the process is super easy. To start, you must be at least 18 years of age, a legal resident of the US and have a social security number. The bank may also request proof of a stable flow of income in the form of pay-slips of tax documents. To apply, all you need to do is visit the SunTrust Website and fill out the online application form. Once you have submitted all the correct information and uploaded your supporting documents, the bank will get back to you shortly with whether or not you application has been successful. The annual percentage rate is 13.49% to 23.49%, based on your creditworthiness when you open your account. Your due payment date is at least 25 days after the close of each billing cycle. You will not be charged any interest on purchases if you pay your entire balance by the due date each month. The annual membership fee is free for the first 12 months, but after that, you will have to part with $89. There are penalty fees of up to $39 for late and returned payments. For more information on fees, you can out the terms & conditions on the SunTrust Bank website. If you love travel a lot, this is the perfect credit card for you. Head to the SunTrust website and apply for a SunTrust Travel Rewards Credit Card today to begin enjoying a world of benefits and rewards.